Tommy is dumped by his girlfriend on Valentine’s Day. His friends come around and vent non-stop about women. Then a group of women turn up and vent non-stop about men. This film sports an incredibly fast, theatre-style dialogue throughout. In fact, the film is really just a series of aggressive monologues. There’s a lot of talk about love, but it drowns in stereotypes. Again, this film is not really a rom com – there’s very little space for laughter. I don’t think I really like it. 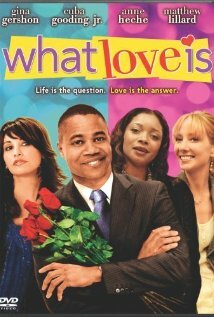 Posted on 27/10/2010, in the whole rom com list and tagged Cuba Gooding Jr. Bookmark the permalink. Comments Off on What Love Is.